Yikes it has been crazy cold here the last few days. I get up and start working at about 5:30 AM and for the last few days it has been zero or less outside when I get up. it has been so cold I have been using fingerless gloves while I type in the morning just to keep my hands warm! Anyway, when the weather is this cold all you want to eat is something warm and hearty, and for us that means soup or stew. I found this recipe from Giada De Laurentiis of the Food Network about a week ago and it seemed perfect to make when it was this frosty outside. it is for a cannellini and sausage stew. The recipe is easy, it uses easy ingredients and you can have the whole thing done in about 35 or 40 minutes, so you can’t ask for a meal much better than that! Place an oven rack in the center of the oven and preheat the oven to 375 degrees. Spray a grill pan with the vegetable oil cooking spray. In a Dutch oven, heat the olive oil over medium-high heat. Add the fennel bulbs, onion and 1 teaspoon of the kosher salt. Cook, stirring constantly, until the vegetables are soft, about 5 minutes. 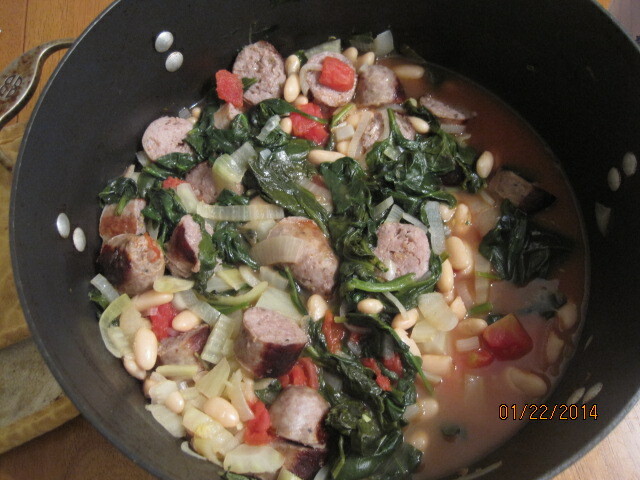 Add the tomatoes plus the juices, the cannellini beans, the kale and the chicken broth. Bring the mixture to a boil and then cover the pan with a tight-fitting lid and transfer the pot to the oven. Cook the stew until the vegetables are tender and the kale has wilted, about 25 to 30 minutes. Remove the pot from the oven and add the cooked sausage slices to the stew. Season the stew with the remaining 1/2 teaspoon of kosher salt. Spoon the stew into bowls and serve. I did make a few minor changes to the recipe. Instead of using kale, I had spinach on hand and used that instead. I actually prefer the flavor of spinach to the kale and I think it worked just as well in the stew, so the choice is yours as to which you like better. Giada also puts in 1/2 teaspoon of red pepper flakes, which I left out. My family is not too big on the heat so I didn’t see the need to put the flakes in, but if you like the stew a little hot (and I think it would be good with some heat) I think you could put it in or even use hot sausage instead of regular sausage. 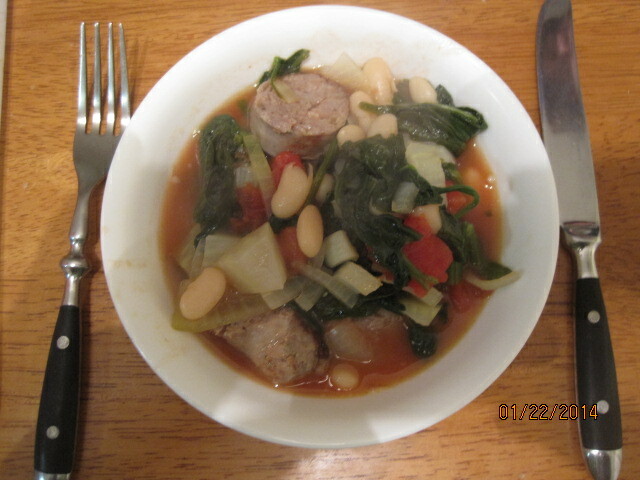 I loved the flavor you got from the mix of the beans, sausage and spinach and the tomatoes and broth added just enough liquid to the mix. The fennel gave the whole dish a great flavor too. I will definitely be making this one again. That’s all I have for today. Check back next time for another recipe. I actually have a soup recipe I am making tonight that I’ll be happy to share. It’s Alton Brown’s take on lentil soup and it smells pretty darn good right now. Until next time, enjoy the rest of your day, try to stay warm and enjoy your meal!